Though Reiki (pronounced ray-key) is ancient in its origins, it still remains applicable to your life today. Are you looking for ways to reduce your stress level, relax, and simply feel more ‘whole’ – body, mind and spirit – again? Then Reiki might be for you. Reiki is Japanese in origin, and is a simple, but effective, technique for transferring healing energy from giver to receiver. The word Reiki, roughly translated, means guided universal or life force energy. This healing art is administered from the giver (your Reiki practitioner) to receiver (you). Reiki attunement is received from certified Master-Teachers at various levels, allowing the student to tap into an unlimited supply of life force energy, enhancing all qualities of life and health. This energy attunement opens a channel in the giver, allowing the energy to flow through to wherever it is most needed in the receiver. This can occur on a physical, mental, emotional, and/or spiritual level. Often, situations of mental stress, compounded with physical illness or problems, have a long lasting and very negative effect on our day to day lives. 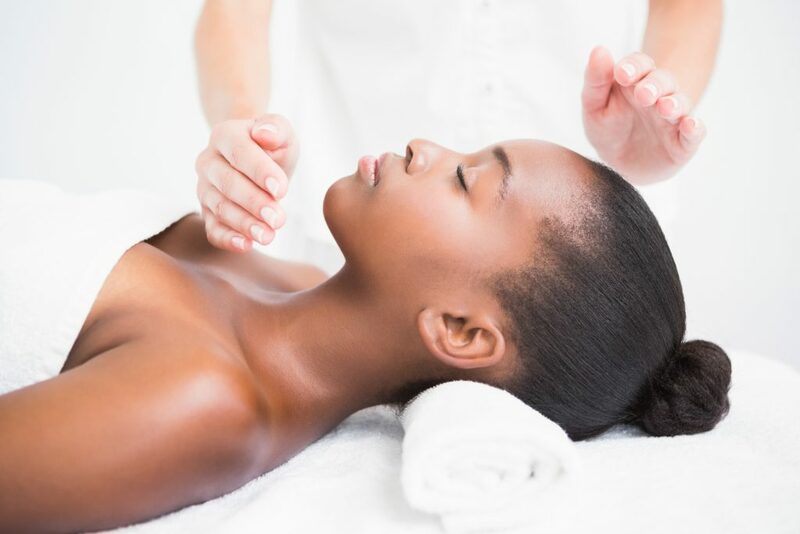 Reiki can work in conjunction with medical or mental treatment, offering a way to attune your own life force and energies, quieting your mind and relaxing your body. Experience a unique and personalize healing session for your needs with our on-site Reiki Practitioner. Find emotional harmony, mental calm, and improve your physical wellbeing. Just for today- I will not anger. Just for today- I will not worry. Just for today- I will be thankful for many blessings. Just for today- I will work with honesty and integrity. Just for today- I will be kind to all living beings. Reiki has roots in ancient teachings and methods from many eastern traditions, but the modern art of Reiki began with Dr. Mikao Usui, a Christian priest of Kyoto, Japan. During his time teaching Christianity in the 1920’s, some of his senior students asked him if he believed in Jesus’s miracles and asked how they had been done. Dr. Usui had no answer for his students; this realization led to a change in his life. He gave up his position at the university to pursue a study of the healing methods of Christ. This quest led him an examination of Sanskrit and research into the original writings of Buddha, who was also known for his great healing works. During his time of study, Usui stayed at a Buddhist monastery and became friends with the head abbot. On the abbot’s advice, Dr. Usui embarked on a 21-day meditation and fast on a holy mountain near Kyoto. On the 21st day, he had a very deep and powerful meditative experience. He saw lights in the sky, which moved quickly towards him. This light struck him in the middle of his forehead (the third eye/sixth chakra) and he found himself in a state of extended consciousness. In this state, Usui saw many small bubbles of rainbow colored light all around him; in this light, he recognized several of the symbols he had encountered in the Sanskrit documents. In that moment, things became clear to him- the potential application of the energy he had received and the mantras in the writings he had studied. After this incredible experience, Usui began his descent down the mountain. As he did so he stubbed his toe, making it not only throb but bleed. As he held his toe in response to the pain, he felt the warmth of what we now know to be Reiki flow through him. The bleeding and pain instantly stopped at his touch and this experience is what inspired Dr. Mikao Usui to build the foundation and culture of Reiki.